Was It a Mistake to Start A.J. Burnett Last Night? One gets the sense this morning that Joe Girardi may regret announcing his Game 5 starter as early as he did. By making the decision to start A.J. Burnett in Game 5 before Game 4 even started, Girardi was preparing his rotation as you'd expect him to in the event of a Game 4 loss. In that case, the decision would be understandable, because Chad Gaudin pitching against Cliff Lee with the series tied at two is a scary prospect. With a 3–1 cushion, though, Gaudin versus Lee isn't nearly as crazy. By starting Gaudin last night, the Yankees would probably be conceding the game, since you can't realistically expect much from a guy who hasn't started in over a month. (Lee wasn't particularly sharp last night, though, so who knows?) But Girardi would have been making a trade-off: Greatly weaken their chances in Game 5, but strengthen the rotation down the line, especially for Game 6. In such a scenario, A.J. Burnett could have pitched tomorrow on full rest, and Girardi would even have an option for a potential Game 7: Andy Pettitte on full rest, or Sabathia on short rest. As it stands now, Pettitte — who's 37, by the way — will likely start on three days' rest for the first time since doing so with Houston in 2006. Girardi could have weakened the team for just one game; now, he's weakened them for the final three. 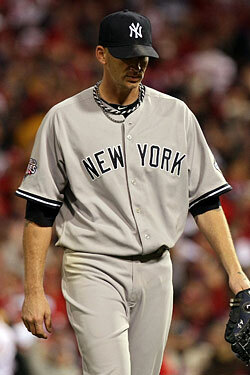 Technically, Joe Girardi hasn't announced Pettitte as his Game 6 starter yet. He'll presumably do so later today after seeing how Pettitte feels physically. But if Girardi wasn't willing to use Gaudin in Game 5, we're comfortable saying he won't want to use him in Game 6, either.